A penthouse is positioned on the top floor providing you and your family a place to enjoy privacy, plenty of space to indulge in the beauty of nature, and great ventilation. Living in a penthouse comes with great responsibility to design it stunningly. While designing, you want your windows to look sophisticated and uPVC sliding windows can give you that look. They are super-efficient and require the least energy to operate. They have several excellent features which make them the ideal choice for specific home-building needs. So let’s explore the advantages of having a uPVC sliding window in your gorgeous penthouse. A penthouse is famous for its space and uPVC sliding windows offers you to the chance to creatively use that option. They can consume at least 80% less space than traditional doors and windows. 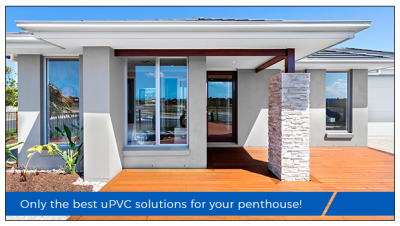 These uPVC products just take the minimum space at your penthouse. Your penthouse design will be premium with such additions. The uPVC sliding windows come with a super-efficient double glazing that leaves no space for increased consumption of energy. This ensures that the heat and cool air does not pass out of the room, making the energy bills lesser than ever. In comparison to regular windows, uPVC sliding windows have a life cycle that is almost triple. Moreover, since these products are temperature and termite resistant they outlast the traditional doors by almost a complete lifetime of wooden or aluminium doors used in traditional buildings. The maintenance of uPVC sliding windows is negligible. The zero maintenance required to keep them handy is one of the most useful benefits to get them fitted in a huge penthouse design with all forms and style. Last but not least, uPVC sliding windows can add to the aesthetic decor of any living space. These wide windows allow maximum brightness and views to make your beautiful penthouse space look bigger and more inviting. With stylish uPVC window frame designs, residents can enhance their decor and choose a style that best reflects their personality. With perfect penthouse design and classy uPVC windows, one can brag about living in a penthouse. And if you are planning for uPVC windows and living in a penthouse, you should definitely check out Aparna Venster. Give them a look, they might be just what you have been waiting for.